Olive Oil – 4-5 tbsp. Goes very well with stew. Pour boiling water over the tomatoes, remove the skins and cut into pieces. Peel the onions and chop on a board. Heat 2 tbsp. of olive oil and steam the onions until they become translucent. Add the tomatoes. Stir with a wooden spoon and simmer for 15-20 minutes. Heat the meat broth from the stew. Add the remaining olive oil to a Cocotte, heat and add the rice. Stir with a wooden spoon. 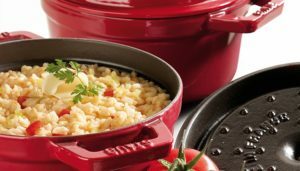 As soon as the rice is translucent, add the tomatoes, onions and enough broth from the stewpot so that everything is covered. Add salt and pepper. A pinch of saffron may also be added and stirred in if desired. Simmer uncovered. Simmer at a mild heat for 18-20 minutes always adding the broth. Add the Parmesan shortly before serving. Stir carefully. Arrange on the serving dish. More than 1,500 chefs and fans of French cuisine were in Lyon on Friday to honor their ““pope of French cuisine”. 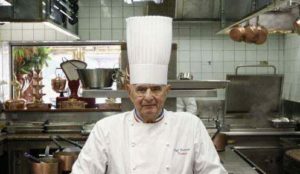 Paul Bocuse, a highly celebrated French chef died last Saturday aged 91. The pioneering chef, died in the town of Collonges-au-Mont-d’. Here he was born and ran his main luxury restaurant of three Michelin stars. French President Emmanuel Macron paid tribute, describing him as the “incarnation of French cuisine”. Born into a family of cooks that dates to the 1700s, Bocuse presided over the kitchen of his world-famous red and green restaurant, L’Auberge du Pont de Collonges, and often greeted guests even in retirement. His renowned dining spot, which features a painting of the master chef himself on a wall. 20 January 2018: Dies at his restaurant in Collonges. For the question of January 27, 2018, you have to visit RFI Sound Kitchen. This article helps you to find out the correct answer. Be sure to recheck the answer, as we don’t call our’s one is right. Please note, you have to send your answer before 26 February 2018. Winners will select on the next week’s show (03 March 2018). Don’t forget to write your name and address, with you RFI ID (if you any).